Everyone is talking about death high on Mount Everest. There are 100 things that can kill you climbing Everest. If people are not taking personal responsibility, coming with the right experience, understanding of how they personally adapt to the lack of oxygen from previous 8,000m peaks, of course people are going to keep dying on Mount Everest, in a place which is called the death zone with 33% oxygen in their system to keep them alive. Why are people dying on the mountain ? What is more shocking is people dying on the trail and trek to Everest base camp.This should definitely not be happening and people racing up the trail, spending less nights acclimatizing to the lack of oxygen is not acceptable. From my 30 journeys up and down the trail to Everest and standing on the summit, I would say 40% of people are coming in the wrong gear and without putting in the necessary physical conditioning needed to make this journey. 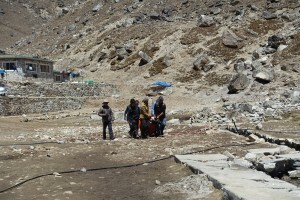 The Everest Base Camp Trek is for Trekkers not Tourist. Hans Sundstrom from Sweden describing what he witnessed of a death on the Everest trial at 4,920m in Lobuche just a few weeks ago. ‘I was met with a very disturbing scene as I walked into camp at Lobuche where 6 or 7 Sherpas were carrying a lifeless person in a sleeping bag to the helicopter pad. When we got into the teahouse the ambiance was eery suggesting that something bad had happened. There were initial comments made by various guests suggesting that someone had died. It soon became apparent that it was a 67 year old Korean trekker who had died just minutes ago. He had suffered from gradually increasing AMS symptoms all the way since Namche bazaar 3,440m and ignored his Nepalese guide’s advice to stop and descend. He had reached Gorak Shep 5,180m and possibly EBC when symptoms became so strong he had agreed to descend. He rode into Lobuche where he collapsed in front of the tea house. The staff tried to administer both oxygen and dexamethazone all of which to no avail. He died right on the spot. His fellow trekkers were still on the way down when this happened and we witnessed their reaction first hand as they were told that their friend hadn’t made it and just passed away despite their efforts to provide oxygen and dexamethazone. They were devastated when they were told this, and basically mentally collapsed not being able to grasp what had happened. They also told that there were more people in their group still out there not knowing about what had happened. My view is that trekkers should and must listen to their guides be they foreign or local (Nepalese in this case) when going on altitude treks. Given that one cannot be sure how one reacts when having AMS symptoms its worthwhile to discuss how to deal with this within the group and with guides prior to setting off. Chances are someone suffering from AMS is unable to make rational decisions while it actually happens. I had the benefit of having unrestricted time and did the stunning but more time consuming Jiri – Namche trek rather than flying into Lukla which both took me through a much less visited part of the EBC trail as well as provide excellent acclimatisation. Once we hit the main EBC trail with much larger volumes of trekkers it was apparent that many go to the Khumbu region with inadequate preparations and trekking gear/outfit. Trekking in denims and wearing sneakers is fine for a Sunday walk in the park but not conducive to a safe and enjoyable extended high altitude trek on uneven rocky paths. We also met people without rain wear – wearing black garbage bags with openings cut out for arms! There are local companies rushing people up the trail fast, clients are getting sick and have be be evacuated off the trail. Also clients are telling local guides how fast they want to walk and dictating the pace and how their trip should run. This has to stop. Altitude sickness is real. Pacing each day of the 13/14 days trekking, along with additional nights (3 NIGHTS) is needed around Namche Bazaar (3,500m/ 11,500 feet) to give people the best chance to making it safely to Everest and more importantly being able to walk back down after having one of the best experiences of their life. 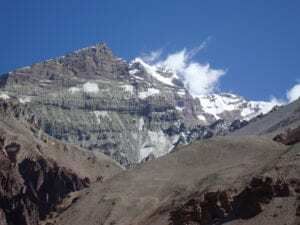 If you are considering the trek to Everest you need the best acclimatization schedule to give you the best chance at a safe and enjoyable experience. Get training, get prepared and respect this mountain environment. Your achievment will be crowned by having successfully trekked up to Everest base camp and Kala Phattar but the achievement is in having a life changing journey and experience that challenges you to be better take on bigger challenges in your life and grow from and develop from such an experience. Not pushing low oxygen environments, cutting corners and days of acclimatization. Think of your safety and the safety of our staff and fellow trekkers when you sign up for a trek.